Ferrero International S.A., the parent company of the Ferrero Group, approved the consolidated financial statements of the Group for the year ending 31st August 2013. On that date, the Group was comprised of seventy-three consolidated companies, with twenty production plants (three of which are operating within the framework of the Social Enterprises), whose products are taken up by over one hundred outlet markets. The Group, whose Chief Executive Officer is Giovanni Ferrero, closed the year with a consolidated turnover of 8,100 million Euros, up 5.6% over the previous period with a total of 7,670 million Euros (a figure that was reclassified later on due to minor accounting adjustments to discounts and a few marketing cost entries). The improvement may be accounted for by the extraordinarily dynamic growth attained in the new markets: Ferrero product sales confirmed and in some cases even improved over the outstanding results recorded in 2012 in Asia, Russia, the U.S., Australia, Canada, Brazil and Argentina. Sales rose strongly in Mexico and Turkey, where new production plants came on stream in the course of the year. Ferrero obtained satisfactory – and in some cases excellent – results in its core markets: the U.K., Poland, Germany and France. Results were not as impressive in the other Southern European markets due to the economic crisis. The products that did best, in terms of sales figures, were “Küsschen”, “Kinder Joy” (known as “Kinder Merendero” in Italy), and “Raffaello”, which contributed to the overall growth in the various markets with volume increments of 42%, 15% and 12%, respectively. Tic Tac, Rocher and Nutella also did very well. Notwithstanding an increase in operating income, with a profit before tax of 795 million Euros, the result for the year decreased by 9.5% over the previous year, because of a drop in financial results due to the adverse effects of exchange rate fluctuations. The investments made by Ferrero during the year came to 525 million Euros, of which 473 million (5.8% of turnover) went to strengthen the Group’s industrial and production activities, mainly in Germany, Italia, Poland, Canada, Russia, Mexico, Turkey and Brazil. 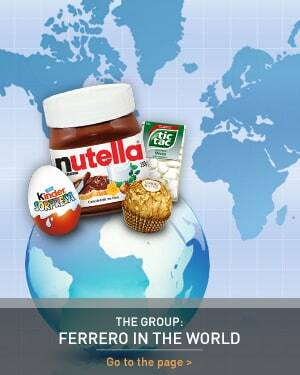 As at 31st August 2013, Ferrero had 30,105 collaborators: 24,797 employees and 5,308 external collaborators.